Three Great Distilleries in North Georgia to Visit in 2018: If you’ve been to the North Georgia Mountains recently you know we have some great wineries up here. What you may not know is that we have some great distilleries up here as well – some with a rich history of making liquor. Moonshine is a heritage that some here in the Mountains can proudly claim. Three Great Distilleries in North Georgia to Visit in 2018: If you’ve been to the North Georgia Mountains recently you know we have some great wineries up here. What you may not know is that we have some great distilleries up here as well – some with a rich history of making liquor. Moonshine is a heritage that some here in the Mountains can proudly claim. 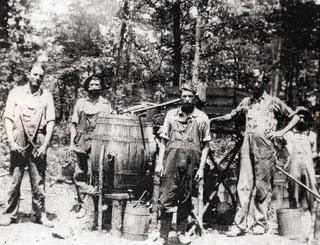 What many people don’t realize is that making moonshine became a way of life in our area because Georgia voted to go dry in 1907 years before the U.S. voted for prohibition. In its infancy it kept food on the table, during the depression. After prohibition ended, as refined liquor made its way back into polite society moonshine found its way back to the shadows of the hills and hollers of our mountains. Moonshine, White Lightning, Corn Liquor, or Whiskey (call it what you want) has never gone away. Those of us who live here have always known someone who could provide. The Farm to Table movement not only renewed interest in the heritage culinary arts such as cheese making, charcuterie, and artisanal baking, but the heritage of distillation as well. Three local distilleries are taking the mountain heritage and making it uniquely their own (legally). Once, one of the premier distilleries in Atlanta, RM Rose closed its doors when Prohibition became the law of the land. Now located nearby in Dillard, RM Rose has begun again. With Georgia Corn Whiskey, Fire On the Mountain, and Good Neighbor to sample along with their Bourbon Whiskey – Straight or Sour Mash you can get a taste of how it used to be done. Established in late 2012 by James Henry Harris III, (Jim), retired chemist, master mind/ master distiller and owner, Moonrise Distillery is located as you enter the City of Clayton in Rabun County, Georgia. This location was chosen for its rich moonshining history, and to compliment the local area by providing jobs, promoting local history and tourism to people traveling through this area. At Moonrise Distillery, they spare no expense in producing high quality Bourbon, Rye Whiskey and of course “Moonshine”, all of our spirits are double distilled. The winner of two Gold Medals from the 2017 Global Spirits Awards in Las Vegas, NV and two gold medals from the 2017 MicroLiquor Spirit Awards the James Henry Rye Whisky and the James Henry Bourbon Whisky are two whiskeys worth tasting. Their Corn Squeezins should prove worthy of it heritage as well. While not technically in North Georgia, Chattooga Belle Farm is just across the border in South Carolina. It is a 138-acre working farm and event destination boasting a stunning 270 degree view of rolling hills, vineyards, orchards and berry patches among the backdrop of the majestic Blue Ridge Mountains. It is also a premier wedding and reception location, the Farm offers a large event barn with 7,000 flexible square feet of space including a great room with a stacked stone fireplace and covered patios overlooking the spectacular view. Belle’s Bistro serves lunch in season, featuring artisan sandwiches, soups and salads made with local food and produce from the farm. On the farm they make not only Whiskey, but Brandy and Vodka as well. The farm proudly claims to grow it, ferment it, distill it, and sell it all on the farm. With Brandy names like Muscashine, Cinnamon Stick, Oconee Belle and Campfire, and Whiskeys called Block & Tackle and Caroline Spice a tasting at Chattooga Belle will be anything but bland. Don’t forget to try their Dark Sky Vodka while you are there. Beechwood Inn (Georgia’s Premier Wine Country Inn): Centrally Located For All Three Distilleries! So now you want to come for a tour (maybe two), where to stay? Since you like the idea of small locally owned distilleries why not keep the local theme going. Beechwood Inn is centrally located to all three distilleries. Owned and operated for the past 18 years by David & Gayle Darugh they know the best local places to eat, shop, and visit after your distillery tours. If you decide to visit on a weekend you will definitely want to make plans for the Saturday Night Farm to Table Dinner. Check out upcoming dinner menus here!